Who We Are All Survivor Stories Jesus E.
My grandpa was diagnosed with non-Hodgkins lymphoma (NHL) in 2007. It turned our world upside-down. You always hear these stories of families going through the motions of this disease but never personalize it until it actually happens to someone you love. With some radiation, doctors were able to rid him of the NHL and he went into remission. Three years later, we found out he relapsed and this time the cancer had spread and over five tumors were detected. This time around, chemotherapy was in the works. He went through his rounds of chemo like a champ and went into remission once again. Over the course of ten years, he relapsed six times. My grandpa's last relapse was terrifying. In October of 2016, he began to experience excruciating pain in his back and leg and many ER visits followed. He was told multiple times it was caused by his sciatic nerve. In March 2017, we were given the news that he relapsed again. Every single time he relapsed, we knew chemo worked well and in only a matter of months he was cancer free. However, this last time, he began to deteriorate rather quickly and chemo was halted because he was too weak to undergo treatment. He was disinterested in food or liquids and was confined to his bed for the last five months of his life. He responded well to chemo after a change of medications but his body could no longer keep up. During his last days, he developed a severe case of pneumonia and we were told he only had a few weeks to live. My grandpa, even in his delirium, begged us to take him home. We were able to finally take him home on August 3, 2017. The next morning, my warrior went home to be in peace. I am convinced he knew he was going any day and waited until he was home. I put my hand on his chest and whispered in his ear how much I loved him and that it was okay to finally let go. He was surrounded by love when he made his transition home and he was not alone. He was always so proud of his daughters and grandchildren and we will continue the fight for awareness, for a cure. Our family walked in his memory during this years Light The Night and will continue to do so until no one has to ever face this disease again. We love and miss him so much! When he left, he took a huge part of us with him and it’s been so difficult to do this life without him. He was the cornerstone of our family, nothing short of amazing and courageous. He walked into a room and immediately filled it with lots of love and lots of laughter! We remember him for his tremendous courage and undeniable strength in the face of adversity and for his undying love for his children, grand and great grand children. But, he is at peace, pain-free, cancer-free, and enjoying those angel wings he has earned. 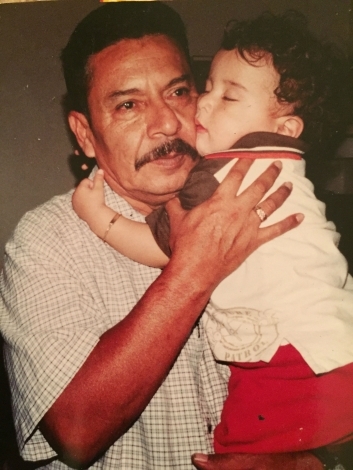 Un día te veremos otra vez y nunca nos volveremos a separar mi prietito lindo.